This species is from South Africa, Lesotho and Swaziland. It requires full sun, a very moisture retentive soil and can withstand temperatures down to -10oC. The name ‘coccinea’ means Scarlet, referring to the colouring of one form of the true species. 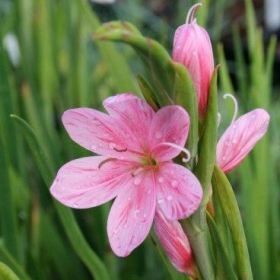 This cultivar bears fresh pink crocus like blooms on spikes in mid-autumn amid grassy foliage and given good weather the show will continue until the first frosts in o November.